The idea for the Nubs came from the theory that a cigar finds its sweet spot at the 3 ½- 4 inch point. All nub cigars must exist within this window. No nub is longer than 4 inches. Further adding to this complex theory, the ring gauges range from 56-66. The result is a range of smokes that have the same amount of tobacco as any Churchill or even Presidente. Unbelievably, they also smoke as long. The Nub Cameroon Wrapper Cigar: Grown in Cameroon, Africa, this wrapper has a distinct flavor and character. The Cameroon wrapper is thin and toothy, yet it delivers rich notes of cedar and coffee. This Nub medium-bodied cigar is available in 358 and 464T formats. The Nub Habano Wrapper Cigar: The Nub's Habano wrapper has always been the wrapper of choice for Cuban cigar makers. It delivers a robust, full-body flavor. It is the most complex of all wrappers. The Nub cigar's Habano wrapper is grown in Nicaragua as are all the long-fillers in this rich blend. The Nub Maduro Wrapper Cigar: The Nub's Maduro cigar is the newest addition to the Nub family. Blended with a Nicaraguan long-filler, the Nub Maduro is rolled in a dark and oily Brazilian Maduro wrapper and is considered to be the fullest bodied in the Nub line. The Nub Maduro offers a creamy, robust, and naturally sweet smoke laced with flavors of dark chocolate, coffee, and notes of toffee on a long finish. 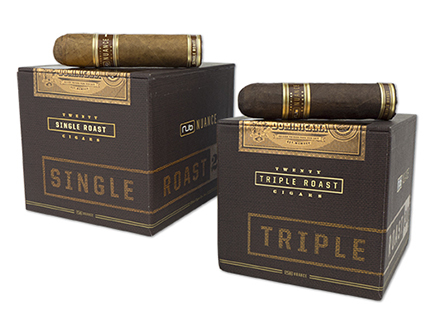 The Nub Nuance Single Roast & Triple Roast (formerly Cafe Cappuccino and Espresso) Cigars: The smooth and creamy Nub Nuance Single Roast cigars feature a Connecticut shade wrapper and offer a mild smoke with a touch of vanilla bean and light notes of cedar. Nub Nuance Triple Roast cigars are wrapped in a rich Sumatra leaf and share a dark cacao flavor and slightly sweet, toasty notes. Both are available in the 460 format and perfectly combine the enjoyment of smoking a premium cigar with coffee. Please note that The Nub Nuance (formerly Cafe) cigar packaging is being updated and during this transition period you may receive cigars with packaging different from what is shown in the images below. The company assures us the blends remain the same.